BOSTON (AP) — The British are coming again — this time in friendship. 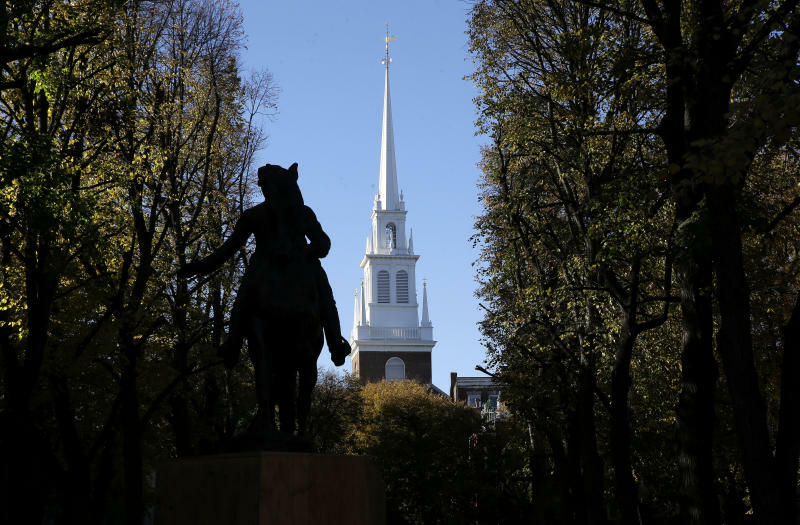 A memorial honoring fallen soldiers from the U.S. and Britain is being dedicated this month, and the venue couldn't be more ironic: Boston's historic Old North Church, where the American Revolution pitting rebellious colonists against English troops basically began. "It's the one place in Boston where you wouldn't expect this to happen," said Simon Boyd, a British-born real estate executive and Royal Air Force veteran leading the initiative. On April 18, 1775, two lanterns were displayed from the steeple of the church — a prearranged signal from Paul Revere that the British were heading to Lexington and Concord by sea across the Charles River rather than by land. That event, immortalized in Henry Wadsworth Longfellow's epic poem, "Paul Revere's Ride," ignited the war of independence from Britain. But Old North Church, Boston's oldest surviving house of worship and the city's most-visited historical site, since has become a symbol of Anglo-American affection. Every year on the Sunday closest to Nov. 11 — the date World War I ended in 1918 — the church built in 1723 has held a special remembrance service for Britons living in or near Boston, complete with bagpipes and poppies. This year's commemoration will fall precisely on the 100th anniversary of the bloody Great War's end. Since 2005, Old North Church also has hosted a touching tribute to American troops killed in Iraq and Afghanistan. 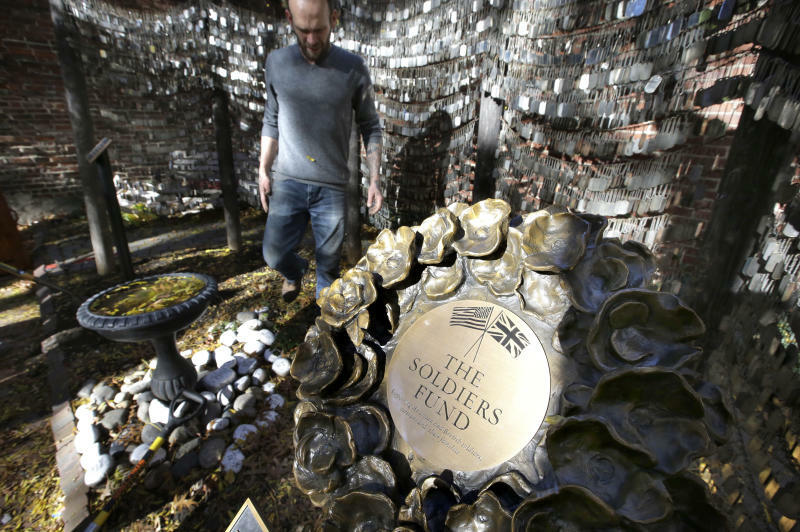 In the courtyard of the church, jingling like wind chimes, hang nearly 7,000 blank military dog tags — one set of tags for every U.S. life lost. The new memorial, a bronze wreath, will honor British and other Commonwealth forces who perished alongside U.S. forces in both campaigns. And a bronze plaque will explain the meaning of the dog tags to the hundreds of thousands of visitors who pause to pay homage each year while walking Boston's Freedom Trail — a 2.5-mile (4-kilometer) route that takes visitors past the church, Revere's house and other historic landmarks. "We once were enemies, but we've long since gotten over that," said the Rev. Stephen Ayres, vicar of Old North Church. "We're now a go-to church for the British community in Boston. That's part of the improbability and wonder of Old North." Bruce Brooksbank, the Iraq-Afghanistan memorial's volunteer caretaker, remembers how soldiers in the 1960s and '70s were disrespected when they returned home from Vietnam. "This is my own little chance to make amends," he said. 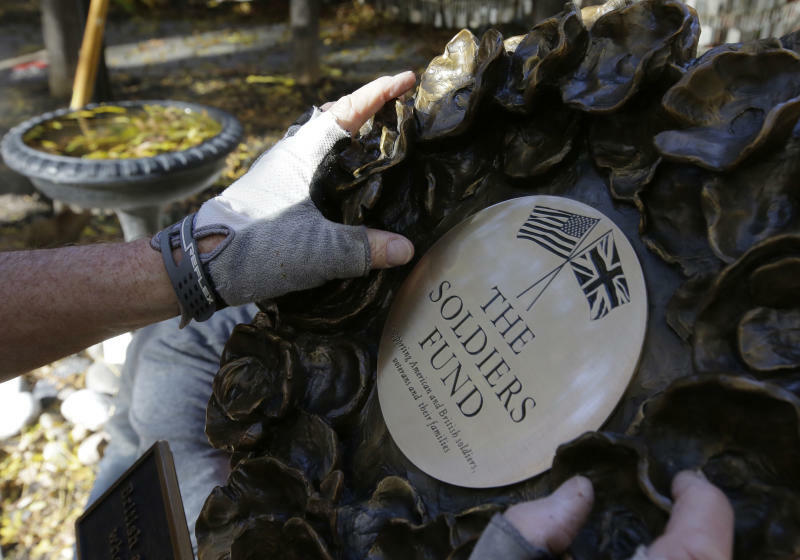 Fittingly, two top soldiers from both countries will join forces on Nov. 17 to unveil the wreath and plaque, both paid for by The Soldiers Fund, a Boston-based nonprofit that supports U.S. and British soldiers, veterans and their families. Retired Gen. Martin Dempsey, a former chairman of the joint chiefs of staff under President Barack Obama who now oversees USA Basketball, and retired Gen. Sir Mike Jackson, who held the highest post in the British Army from 2003-2006 and now is president of Britain's Army Benevolent Fund, will preside over the unveiling. Both will speak at a Soldiers Fund dinner in Boston that evening. There's another tie that binds, said Boyd, who chairs the board of the Soldiers Fund: In 1917, Massachusetts sent one of the largest U.S. regiments to fight in WWI, naively dubbed "the war to end all wars." "We're commemorating British and American lives lost, at a church where Paul Revere said with his lanterns that the British were coming," he said. "It's really all kind of come full circle." Follow Bill Kole on Twitter at https://twitter.com/billkole.